The things you can pick up at a flea market these days. Teknophage wants his robot back. His agent on Earth, Mister Beaumont, brings in a man named Pierce (whose has a buzzsaw for knuckles) to help retrieve it. Meanwhile our heroes figure out Mister Hero is what they’re after and Hodges wants to get rid of him before they get further involved. Jenny wants him to stay and Mr. Hero thinks he has a lot to learn from her and wants to stay. It’s a moot point when the Chameleon agents lead them into a trap while Teknophage sends his man Kingman to tell Beaumont to bring the girl in alive so he can mess with her mind. (He’s rather evil, you see.) However, Pierce just wants to kill everybody, including Jenny and Mr. Hero and just takes the Chameleons down, then attacks the newmatic man. What they got right: Even in the second issue they good a good job establishing the characters, hero and villain alike. The art is good and so is the action. What they got wrong: Is “low-born gutter trash” really that bad an insult? Even Jenny gets on him for using it against the jerks who stole her purse. Other notes: I think Gaiman established his own universe within Tekno Comics. He also had a separate series for the Teknophage as well as his portal, the Wheel Of Worlds. Recommendation: I did some research into the next issue, and there are some interesting ideas here I’m admittedly curious about. Worth looking into anyway. Posted by ShadowWing Tronix on April 12, 2019 in Yesterday's Comics and tagged Mr. 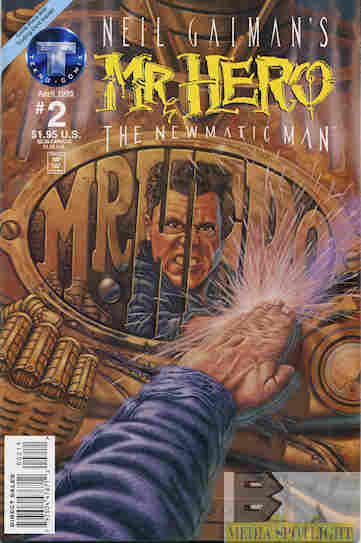 Hero: The Newmatic Man, Neil Gaiman, Tekno Comics.